Does Your Business Need Online Reviews? At one time, consumers relied on recommendations from friends and family members when looking for businesses to use. Now, people are just as likely to rely on strangers. According to the Local Customer Research Survey conducted by BrightLocal, around 72% of consumers trust online reviews as much as they trust recommendations from friends and family members. Additionally, 52% of people are more likely to use a local business that has positive online reviews. This is, in large part, because online reviews create social proof. Social proof is a powerful selling point. When a business has a lot of social proof, it is able to attract a lot more customers. Thus, it is essential that you start gathering online reviews immediately. Sites like Yelp, Google Places and Yahoo! Local all collect reviews. When potential customers go to these sites, they can look at reviews and read comments. They can also see the business’s average rating. Many people live on social networks, so they are a great place to gather reviews and testimonials. People can leave comments on your Facebook wall or Twitter stream, or you can use special applications or features to gather your reviews. For example, you can install the Social Review Tab from Tab Site to your Facebook page. This application will create a tab on your page that you can use to collect testimonials and reviews. If you don’t know how to do this, your social media marketing management company can help. You can also create a business page on LinkedIn, and then upload your products on the “Products and Services” tab. Then, people can recommend your products and leave reviews. Businesses are often so concerned with getting testimonials on review sites that they completely forget about gathering reviews on their websites. You want to gather and display reviews on your website so your customers can see them. Just have your professional web designer put a simple form for gathering these. There are also some professional sites you can use to gather reviews. Angie’s List is probably the best of all of the professional review sites. You have to be a paid member to leave a review on Angie’s List, so you don’t have to worry about getting fake reviews. Also, because Angie’s List requires people to pay for membership, people take the reviews very seriously. 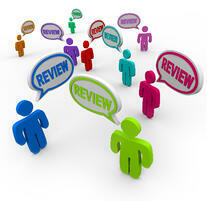 Now that you know about the different review sites, it’s time to learn how to collect reviews. While some people will provide you with reviews voluntarily, it’s important that you solicit reviews on your own. There are several ways you can do this. QR codes are becoming more and more popular. People can get free QR code readers on their smart phones. Once they have a reader, they just need to scan the code, and then they will see a message, a coupon, a website, or anything else the business wants to display. You can actually use QR codes to gather reviews. Put some codes on your marketing materials. Send people to a review site after they click on the code. This will encourage them to leave you a review. Email marketing is an important part of running a business. You can use emails for more than branding and selling products. You can also use them to gather reviews. Just put a link to your favorite review site in the email signature. Have your employees ask people to leave reviews, especially if the customer seems happy with the experience. Also, have employees hand out comment cards. Start using these techniques today so you can gather reviews and improve your online presence.